IBIS (in-body image stabilization): The EM-5 II's 5-axis IBIS is a miracle of modern technology. The difference between that and the EM-1's IBIS is noticeable, especially when hand holding the 40–150mm ƒ/2.8 PRO + 1.4X teleconverter. It works great with the 75mm ƒ/1.8 lens too. High resolution mode: The EM-5 II's high resolution mode is fantastic. The multi-shot technology works well for reproduction (color accuracy, micro contrast, resolving power), still life, and static landscapes. The dynamic range is amazing. I am looking forward to the next iteration of Oly's multi-shot feature. Imagine being able to handhold a camera that shifts the sensor eight times within 1/60th sec. and delivers a high resolution RAW file with super-accurate color. 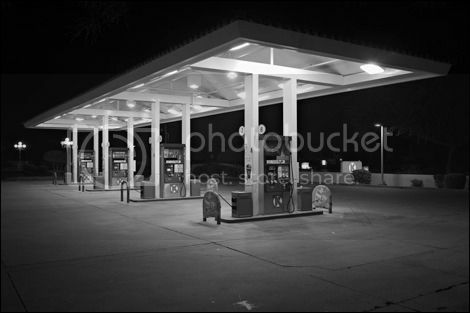 Last night, I took a picture of the neighborhood Shell station with the EM-5 II in high-res mode. The native resolution is 9,216x6,912. That's 25.6x19.2 inches @ 360 DPI. Exposure data: .3 sec. x 8, ƒ/6.7 @ 12mm with the 12–40mm ƒ/2.8 PRO lens. I corrected the perspective in two steps. First in ACR and then in Photoshop CS6. All image data adjustments were made in ACR (curve, HSL [hue, saturation, luminance] for the red, orange, and yellow channels, color temp., and one local adjustment to decrease exposure on the Shell logo). I manually content-filled the lower left-hand parking lot and the bottom of building (that section got cropped out when I corrected the perspective). From start to finish, I spent approximately 30 minutes on the picture. The print, on Ilford Gold Fiber Silk, looks great. [CORRECTION: An earlier version of this article stated that the E-M1 has 3-axis image stabilization. "E-M5, E-M1, E-M5 Mark II and E-M10 Mark II all have 5-axis image stabilisation. It's only the E-M10 (original) that has 3-axis IS. (Ignoring PENs)." Thanks to Josh for this. Bob Rosinsky adds, "Mea culpa; the EM-1 does indeed utilize 5-axis image stabilization (rise/fall along the y-axis, shift along the x-axis, pitch, yaw, and roll). The second generation 5-axis IBIS in the EM-5 II is noticeably better. I must have been thinking of the EPL-5, which only has 3-axis IBIS but employs the same sensor as the EM-1. Sorry for the confusion...."
k4kafka: "Not understanding Bob Rosinsky's exposure time...what does '.3 sec. x 8' mean?" Mike replies: The E-M5 Mark II's innovative high-resolution mode combines eight separate sequential exposures made with very slight sensor shifts into one image. Olympus says the resulting file is equivalent to one made with a 40-megapixel camera. The feature offers versatility for higher-quality shots of unmoving subjects when the opportunity presents itself, such as with still lifes, product shots, and many landscapes. "I have to admit I'm kind of taken with Micro 4/3. I don't like the RAW files as much as Fuji's, but that's rather subjective. Excellent build quality, super-smooth and quiet AF and truly small bodies and lenses are what makes the system." Jack Kurtz: "I have to agree with Bob Rosinsky's assessment of the E-M5 Mark II. The image stabilization is amazing. A real game-changer. I'm able to handhold my 40–150mm zoom with the 1.4X matched teleconverter, total focal length of 210mm (or 420mm in full frame terms) at 1/10th of a second. I've made handheld timed exposures at 2.5 seconds with a 12mm lens. I wish the E-M5 Mark II had the E-M1 autofocus, but otherwise I think the new technology packed into it makes it a real winner." Phil Stiles: "I join the dissent. I own both cameras. For me the option of using a silent electronic shutter is the key feature that the EM-5 has that the EM-1 doesn't. But they both use that oh-so-sweet 40–150mm ƒ/2.8." Mike replies: Be sure to read Moose's comment about silent shutter mode in the Comments Section. Raxtich: "I have both an E-M5 and the E-M1. While I love the E-M5, I could not get comfortable with the ergonomics, so I was reluctant to switch to the Mark II when it came time to upgrade. I chose instead to spend a couple hundred extra for the E-M1 and have not regretted it." I just tested the OMDE5 MkII and in my measurements the multi shot is very limited by diffraction. And the long exposure system, for light painting works wonders for street scenes where one wants to combine the existing light with the traces of passing car lights. It is my understanding that both have 5-axis IBIS. I'm sure it's already been reported, but the E-M1 has 5-axis image stabilization. The E-M5 MkII's is newer and reportedly redesigned with different/better components to afford the high-resolution mode. E-M1's 5 axis IBIS is older than the EM5 mkII's (wow that is a lot to type), but it is definitely a 5 axis design. "The OM-D E-M1 is equipped with the world’s first 5-Axis image stabilization system with IS-Auto"
Please, only 3 axis exist in geometry. Oly's ibis lets its sensor move AND rotate on one plane, and z axis only serves to describe its rotation. It can compensate for various movements (move vertically or horizontally the camera, or both, and also rotate it around any of the THREE axis), but the resulting sensor movements will be only on one plane. Let's leave marketing creativity where it deserves. The EM-1 has 5-axis IBIS, not 3-axis IBIS. The original EM-10 had 3-axis IBIS, but it's the only OMD model to ever have 3-axis. Correction: the stabilization in the E-M1 is 5-axis, not three. I believe the EM1 also has 5 axis IS. One thing we can all agree on is that Olympus has created the most confusing model naming scheme ever. I usually don't pay much attention to 4/3 cameras, but while reading this post I clicked on the link. Mein Gawd -- it's ELEVEN HUNDRED DOLLARS for the body alone! The menu is confusing. Never understand which goes to what. Want to do live composing tonight and search the web no idea why it is not on ... Need to turn of bracketing ... May be obvious to someone not me. But with speed booster and nikon 80-400 ... Sort of 600 f4 poor man. That works for some bird photo. Anti-Shock Mode on the Mark I used a slight, adjustable delay after first curtain closing before opening it again for exposure. The Mark II, with A-S set for Zero Sec. delay, uses Electronic First Curtain to avoid both delay and shutter shock. Completely effective. Silent mode adds Electronic Second Curtain - no mechanical shutter action or noise at all. However, Aperture Mode with Auto ISO works quite differently in Silent Mode. With both full mechanical shutter and EFC Modes, the program exposure logic makes sensible choices of shutter speed and ISO, seeming to take into account focal length, as well. Resultant shutter speed and ISOs are like those of the Mark I and the Pens. In Silent Mode, the behavior is quite different. The "program" clings tenaciously to 200 ISO down to ridiculously low shutter speeds, then suddenly jumps to high ISOs when it gets really dim. I had been getting some amazing illustrations of the new IBIS' abliities down to the 1/10 sec. range at 300 mm (600 mm eq. ), but not what I was expecting, or desired, on some things like bird shots. A conversation with Oly support insued, including sample images, EXIF data, and so on. It was left with the tech and others he consulted baffled and asking that I let them know if I figured out what was going on. When I got a second body, and it behaved the same, I was pretty sure it wasn't a sample failure. Then one day I discovered that it only happened in Silent Mode, which I usually had on in the field to avoid scaring birds, butterflies, little mammals, lizards etc. I passed this on to Oly support, who replied "it is possible that the program is different in silent mode, there is a limitation with the technology, or this could be a bug ... can determine if this needs a correction, and if this is possible, include it in future firmware versions." As this post seems to be an illustrated, slightly incomplete, summary of what I and others said in comments yesterday, I thought I'd add something substantive, if a bit arcane, to the collective knowledge of this excellent camera. I have since used this knowledge as an alternate mode for things like running water. The interesting technical point is that IBIS supports the multi-shot because it moves the sensor. Granted, it is a gimmick, but quite useful in some cases. VR in the lens has no similar mode. And Olympus recognized that (at some point) and scored... many designers miss side effects of their beginning assumptions. I saw that constantly in software - see Y2K problem. My next Nikon body could add IBIS and work just fine with all my Nikkors...right? I would argue that the best bang for the buck in Micro 4/3 is a used E-M5 (original). Selling for cheap these days in great condition, excellent 5-axis IBIS, and still very current sensor technology. Plus, both E-M5 I and II look and feel better to me than the E-M1 does. The high resolution mode is a digital algorithm that has been available for well over 5 years. The common term is super resolution. It can be done with any camera. While the Olympus is unique in being able to produce a single raw file, the only real advantage is a little bit of computer time saved vs using a series of 16 bit tif's. That is a correct usage, not “marketing creativity.” In mechanical engineering, there are axes of rotation as well as translation. There are the three spatial translation axes you referred to-- X, Y, and Z, but there are also two rotational axes in the positioning space. For instance, you may of heard of “five-axis milling machines.” That's what that refers to. The actuators in the higher-model Olympus's are indeed five-axis actuators. Putting things in a 35mm terms, the multishot mode is producing optical sensor resolutions in the range of 100 line pair per millimeter over a 35mm frame. That's extraordinarily sharp; one could rarely achieve that in 35mm film and never over the entire frame. When working to that exacting level, the typical optimal aperture would be in the range of f/3.5 to f/4.5, depending on the camera lens. So, what you're reporting is not atypical. It's a simple fact that if one is working for extreme sharpness, one cannot stop down very far before diffraction becomes noticeable. That does not mean the multishot mode is ineffective for smaller apertures. Sharpness is not a simple “weakest-link” summation. At f/5.6, I'm certain that the 64 megapixel photograph is considerably sharper than the 16 megapixel one, even though it won't be as sharp as the 64 megapixel f/4 photograph. I'd bet you better than even money that that's still true at f/8. Not sure about f/11––maybe by that point diffraction is so dominant that it swamps the sensor resolution improvement. Or not. Anyone want to do the test and report back? Just requires two photographs and some pixel peeping on your monitor. Doesn't matter what lens you try it with; with any halfway decent lenses, by f/11 they're all going to look very similar. First, terrific example of what the M5II hi-res mode can do. Should the M1 replacement offer it as a more real-time feature the...spirited discussion of sensor formats should become a lot more interesting. As a happy E-M1 customer comparing the two models, the M5II wins on a few counts, including the already discussed hi-res mode and the 1-stop better (per Oly) IBIS. There are a few minor advancements, including the swing-tilt display for those who prefer that, and better video. The "pentaprism" hump is smaller due to Oly ditching the accessory port below the hotshoe, an aesthetic improvement to my eye. In sum, money is better spent on the E-M5II but for a a few items: body design (the pronounced grip), hybrid CDAF-PDAF and the resulting ability to use four-thirds lenses. That last is what keeps me very happy with my older camera, because several four-thirds lenses will never be replicated for µ4/3. The next E-M1 edition should be a barn-burner, given Oly's pace of camera advancement. Add one more remark and this still not resolved. Can you actually get a clean HDMI output from OM-D and if so, is it really operable. I look around and everyone said it has clean HDMI. Playing nearly 2 hours and still no end to this. GH4 just plug and work! I like the handling but the manual and too many only-if-you-know-these moments. Thanks ctein, clearer to me now. Didn't know a rotational axis counts as a different axis from a translational one. In this case 5 is the correct number. I referred anyway to the sensor movement, while I understand now that the number is related to the camera movement. Five camera movements, so to speak, which give anyway three sensor movements (x, y and rotation). Is it correct? Robert Harshman, I don't believe I agree. I wasn't familiar with these techniques, so I took a little tour. None of what I saw involved extremely high precision movement of sensor or static subject exactly calibrated to sensel locations. The math may be similar, and what Oly has done might not have happened without these predecessors, but what it has to work with seems to me significantly different. Hassleblad has previously done something similar to, but not as good as, what Oly has done. What Oly has added to the idea pioneered by Hassleblad is additional exposures at pixel pitch distances. This means no decoding to infer colors for each pixel. Each pixel location is individually sensed by sensels of each color. This both eliminates moiré and increases color accuracy. The results on things like fabric are sensational. I'm not talking theory. Take a look at the 100% images of repeating patterns in the IR review. I've also carefully compared the standardized test images on IR and DPR for the Mark II in S-R mode to the Nikon D850 and D900. The D900, in particular, suffers terrible moiré from the lack of an AA filter, and the E-M5 II gives superior results to this much higher resolution sensor camera with many subjects. I haven't looked at the innards, but I *think* the sensor actuators can rotate the sensor about any of the three axes-- X, Y and Z. So, that'd be "five-axis" sensor movement. Superresolving techniques have been around for a lot longer than five years-- twenty, at least. But, so what? That's kinda like saying that film's been around for a century, so a new film isn't really "new." Olympus' particular implementation may or may not be unique (and, who cares?!?! ), but it is very uncommon at the least. It cannot be "done with any camera." Robert's simply got this all wrong. All you guys, simply have it wrong. It's easy to do, and there is no difference of significant. There are curious unexplained questions about Hasselblad's and Olympus' recent versions of superresolution -- it's more than just deBayering by moving the sensor so that each pixel gets measured behind all four filters. Hasselblad offers a four shot and a six shot mode. The four shot mode is probably just deBayering, but what are the next two shots in the 6-shot mode used for? My guess is that they move half a pixel distance in each of the x and y directions for the next two and use the extra data to increase spatial resolution, but with less accurate color information for the sub-pixel fill-ins. Olympus' press materials said that all movements that their 8-shot process takes are half-pixel steps. They don't spell out the exact sequence. It might be that the steps are origin, one step right, then right again, then up, up, left, left, then down, ending half a step above where you started. (That's a bit like have two overlapping sublattices of "virtual" Foveon-like all-color pixels, hence strongly suppressed Moire.) But the camera outputs the 8x16=128 MPx of information in two forms, a 40 MPx JPG and a 64 MPx TIF-like ORF file. The ORF file describes an image made up of "virtual" pixels, with a spacing smaller by a factor of sqrt(2), lying under a "virtual Bayer" filter with the same smaller spacing. As a result of this simple (but "virtual") presentation of the HighRes data, programs like Sandy McGuffog's AccuRaw could decode them immediately. I don't think we have to descend into evil Fourier Space for this one. If the positioning is sufficiently precise, the results will be good enough just using simple difference equations, which would require a lot less computation. That's the way asymmetric-resolution scanners do it; they don't have much in the way of brains. I'm happy to be convinced. So, show me. You say you can do it with any camera and it's easy? Pick the camera of your choice, work your magic, and e-mail me (ctein@pobox.com) the before and after photographs and a description of what you did on the computer to get from the former to the latter. No rush. Whenever it's convenient. @ctein "I haven't looked at the innards, but I *think* the sensor actuators can rotate the sensor about any of the three axes-- X, Y and Z. So, that'd be "five-axis" sensor movement." I would verify, I think the sensor can rotate on z axis only. Rotation on x and y axis would have a different effect than compensating camera movement and cause focusing issues. Every time Olympus mentions five axis, they talk of camera movement and gyro-sensors, not sensor movement. Hi. I'm an antiques dealer and I use the MkII almost daily to take still shots of my paintings. I use photographyes in natural light and in Ir and Uv (i have some modified cameras) to study the conservation, comosition and every other aspect of the paintings: my photos are puplished in catalogues of museums like the Louvre, Meetropolitan, Uffizi and so on. In 35 years of activity I've used almost every type of high-quality cameras in large format, medium and 35mm: Sinar, Hasselblad, Linhof, Pentax 6x7, Zenza Bronica, Contax, Nikon and Leica just to name some. The arrival of digital technology has been a disaster: I have bought some of Nikon D 200-300 but photos never reached the quality of the old ektas (or velvia) so I was forced to call professionists with large format backs (Leaf) to obtain a decent quality. I was using a Pen as my everyday camera and I bought for curiosity a Omd5 and a Zuiko 60mm to take macro shots at 1:1. I was amazed of the results: jpgs that I can use right out of the camera, overall good quality of camera and lenses and reasonable price. I've booked the MkII two months in advance and I'm using it since march. I've already shot many thousands photos and I can say that in the real world the results of an Hi-res photo shoot with the 12, 25, 45 and 60macro are at least at the same level of what you can get with a Leaf back (2013 generation, not tryed the last ones, Mamiya body). Thanks to a good viewfinder I use daily also my old Novoflex 60+ macro bellows for incredible hi-res photos up to 10:1 that let me study the composition of colour without messing up with the microscope... So in my experience, at the moment, for painting reproduction is by far the best camera you can buy - no matter how much you pay. p.s. : not a photo of my website was shoot using an olympus camera. Sorry, it's an old site.